The world of data security has evolved at breakneck speeds, driving a growing need for Managed Security Services Providers (MSSPs). Enterprises today are being hit by a triangulation of events creating an entirely new—and daunting to manage—security environment, says says Jeff Multz, director of North America Midmarket Sales at Dell SecureWorks. Multz notes that today’s hackers are savvy and focused on generating wealth. They include members of criminal-to-criminal networks where exploits can be bought and sold, as well as the ill-gotten information and identities from them. The only marginally positive news he gives is these hackers want easy returns, so a higher dedication to security than other businesses in the same category and geography can discourage attention. “Add to those the hardest economy in the entire world. With all this coming together it’s a very ugly environment for organizations trying to conduct business safely.” When financial times are tight, often two of the first areas in which budgets are cut are software development and security, both of which create fresh vulnerabilities for companies, he notes. Still, by necessity, business is conducted in an increasingly networked world from which enterprises cannot possibly disconnect. “The Internet is the dirtiest place in the world to do business, but I’ve got to do business on it. So, now what?” Multz asks rhetorically. His answer is a 24x7x365 focus on spotting and combatting threats; however, few businesses can afford a dedicated five security professionals—a minimum for even a small business—to keep eyes on the ball at all times. With many enterprises without even a single dedicated security professional, this is where an MSSP like Dell SecureWorks come in. That unprecedented research, contractual Service Level Agreements and transparency through its comprehensive “Glass House” portal are what sets Dell SecureWorks apart from others, Multz says. According to analyst firm Forrester Research, companies are considering MSSPs in order to reduce capital investments, fill in gaps in headcount, increase value over time and keep up with ever-changing regulations and laws. Multiple layers of defense are also needed, for example, for end-point security. Trend Micro Worry-Free Business Security Services provides continuous protection for the workforce by defending against common viruses and threats while Dell SecureWorks delivers award-winning information security services that protect your IT systems and minimize the impact of cyber attacks within organizations. Multz adds that many businesses would think nothing of ensuring 24×7 security for their bricks-and-mortar establishment. “For every dollar spent on vaults and guards we should be spending at least that much on data security,” Multz says. 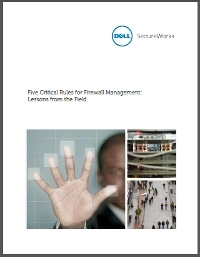 Featured Sponsor Whitepapers Five critical rules for firewall management Dell SecureWorks’ network security team identified five focus areas for IT managers when managing their firewall. The actions outlined in this white paper can help IT managers save time, money and administrative burden. Download Now! Managed Security Services, Q3 2010 This Forrester’s Report features a 78-criteria evaluation of managed security services providers (MSSP). The report highlights which companies lead the pack, which ones are catching up and how. Download Now! Manufacturer Simplifies Security Across All Platforms Read this case study to see how switching to Trend Micro has resulted in a noticeable drop in web threat-related incidents for this company. Download Now! Information Security Services Advantages of managed security services vs. in-house security information management (SIM) Download Now! Take Your Own Path – Warren Brown Warren Brown is a celebrity baker and founder of CakeLove, which includes seven retail storefronts in the Washington, DC, USA metropolitan area. Learn how Dell helped Warren overcome business challenges through technology. Watch Now! New CNBC News Report on Zeus Bank Trojan CNBC turns to Dell SecureWorks for its cyber security expertise in the filming of the riveting documentary: “Code Wars: America’s Cyber Threat”. Learn More! When Computer Viruses Attack Dell’s mobile solutions help offices through any pickle, even when the nastiest computer viruses attack! Watch Now!